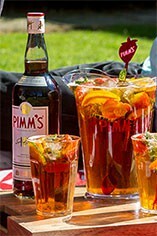 Pimm’s is a brand of English fruit cups, traditionally mixed into a long drink with lemonade and fruit to form a summer cocktail. It is a staple drink at British summer events including Wimbledon, the Chelsea Flower Show, the Henley Royal Regatta and the Glyndebourne Festival Opera. The origin of Pimm’s is in the oyster bars of London back in the early 19th century. At the time it was popular to take gin when eating oysters, but James Pimm thought that gin on its own was too bitter. At his famous central London oyster bar his patrons were encouraged to try the Pimm’s house cup – a palatable gin based drink flavoured with liqueurs and fruit extracts. The popularity of Pimm’s spread quickly from oyster bars to gentlemen’s clubs, and across the whole of the British Empire. The recipe itself is a closely guarded secret.